There may be more delays in the canal expansion but a strike at this moment will not be the cause. 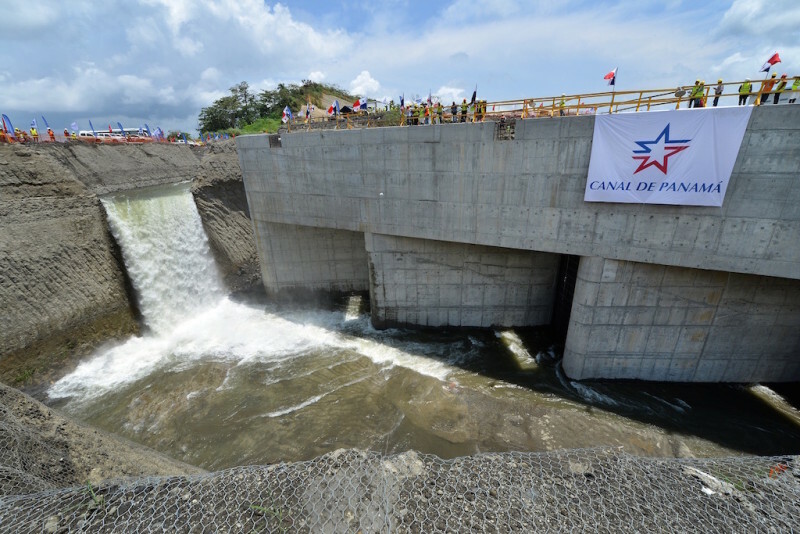 Photo by the Panama Canal Authority. On the afternoon of August 11 two ballooning problems for the Panama Canal Authority (ACP)deflated. First, it was announced that talks between the GUPC consortium that’s building the new locks and the SUNTRACS construction workers’ union had come to enough of an agreement that the union suspended its call for an August 12 walkout. Later, Minister of Canal Affairs Roberto Roy, citing a call by anti-corruption czarina Angélica Maytín for action to suspend or remove ACP board member Nicolás Corcione and general provisions of the code of ethics for Panama Canal Authority employees, announced that Corcione’s colleagues on the board would address the matter. Under their contract the workers were owed pay raises on July 1, which GUPC had not paid. The agreement give canal expansion construction workers their raise, retroactive to July 1. GUPC complains that the ACP ought to pay for the raise but PanCanal administrator Jorge Luis Quijano rejects that, warning that the pay issue is between the contractor and the union. The implicit threat is that if GUPC provokes a strike that delays the project’s completion — again — the consortium won’t get any relief from the late delivery penalties that are part of its contract with the ACP. A sub-text of what’s going on is that the previous canal administration improperly accepted an unrealistic lowball bid from GUPC, as is the norm with such schemes to contractor is trying to add extra charges to the bill to make up the difference on its low bid but the new administrator is unwilling to play that game. Corcione is accused of coordinating bribery, kickback and money laundering scheme for construction and renovation work on the nation’s courts, with the ultimate beneficiaries jailed former presiding Supreme Court magistrate Alejandro Moncada Luna and former Vice President Felipe Virzi (who is under house arrest) and Corcione taking a payment of at least $200,000 for his role. Testimony from others involved in the scheme and a money trail though Banco Universal, which the government has taken from the Virzi family and has put up for sale, points to Corcione. But he claims that as a member of the ACP board of directors he is immune from being investigated or prosecuted by ordinary prosecutors. That claim is widely reject, now including by Administrative Prosecutor Rigoberto González Montenegro, who opines that membership on the ACP board of directors is not an administrative post calling for special procedures against a person in that position. Roy didn’t set a time for the ACP board to meet about Corcione, but he told La Prensa that this is not a long term issue. Roy’s imprecision about when the meeting will happen my be to allow a race among several possible events — Corcione’s arrest, Corcione’s resignation from the board or Corcione’s flight — to take its course.